Let’s start with a detailed image of how to pollinate Venus fly trap flowers and produce seeds (click on the photo to magnify it to full size). The basic idea of pollinating a flower is that the pollen from the anthers that are on the top of the filaments (stamen) must come in contact with a receptive pistil. The pistil is the greenish round thing in the center of the flower. At the top of the pistil is the stigma. A Venus Fly Trap stigma is receptive when it looks fuzzy. If you look at the above photo, you can see the little yellow balls (anthers with pollen) at the end of the stamens. You will also notice that the stigma looks fuzzy and is therefore receptive. So, if you were to take a cotton swab or toothpick and touch it to the anthers and then touch it to the stigma, this would result in fertilization. If you inspect the pistil after fertilization, you should be able to see the pollen in contact with it, but you might need a magnifying glass to actually see it. An alternative and less tedious way of pollinating the flowers is to just take two flowers that have receptive pistils and rub them together. It isn’t absolutely necessary to pollinate the flowers yourself. 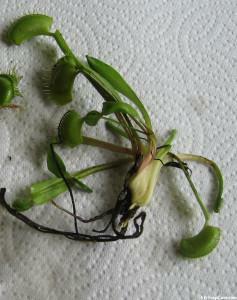 If you are growing your Venus Fly Traps outside, it is likely that an insect will do the work for you. 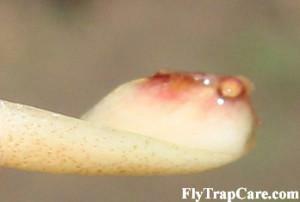 Venus Fly Traps can be self pollinated, meaning that you can fertilize the pistil with pollen from its own anthers. However, most growers of Venus fly fraps agree that cross pollinating plants results in more seeds and a better germination rate of the seeds and more robust seedlings. Cross pollinating means that you take the pollen from the flower of one plant and fertilize the pistil of a completely different plant. When I say completely different plant, I mean not another flower on the same plant or not another plant that is genetically identical. However, I haven’t noticed any significant difference in seed set from self-pollinated flowers when compared to cross-pollinated flowers. Both seem to set seed quite well. But there are certain varieties of Venus fly traps that never seem to set much seed. A few days after fertilization, the flowers will wither and die. 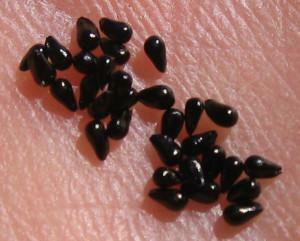 Once the entire flower and stalk are dead and black, carefully examine the material left where the flower used to be. If you were successful in pollinating the flower, you will have a little pod full of 20 to 30 shiny, black seeds about 1.5mm in length. If the pollination attempt was unsuccessful, there will only be dead plant material. If you were lucky enough to get seed, sow it immediately. The longer you wait, the less viable the seed is. Most carnivorous plant seeds need stratification (a period where the seeds are kept cold and wet), but Dionaea muscipula seeds do not. 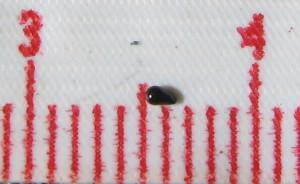 After about 100 days, Venus Fly Trap seed viability begins to decrease. The seeds can be preserved for up to a year while still germinating at a high percentage rate by putting them in an air tight container and in the refrigerator, but the germination rate will be less than if they are sown right after the seed pods open. 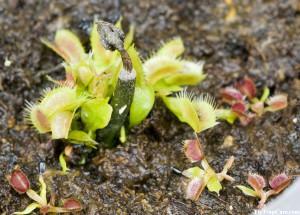 Sow the Venus Fly Trap seeds on the surface of peat moss or a mix of peat moss and sand or perlite. Keep the humidity high and the media moist at all times. Try to keep the temperature between 70 and 85 degrees Fahrenheit. To keep the humidity high, it is best to grow then in a terrarium or in a mostly-sealed container in direct sunlight. Be sure not to let the seeds get too hot though if you put them in direct sunlight. You will have to open the container often to prevent cooking them. Alternatively, you can just leave the container open and mist the seeds a couple times a day. Make sure the soil always stays moist. Try to give them at least 13 hours of sunlight or fluorescent light a day. They should germinate between 15-30 days after sowing, though it could take a couple months. If you plan on attempting to sexually propagate Venus Flytraps, be sure to read this excellent write-up of how to grow Venus Flytraps from seed. Venus Fly Traps are very slow growing. 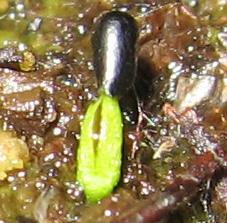 It takes between three to five years to raise mature plants from seeds. 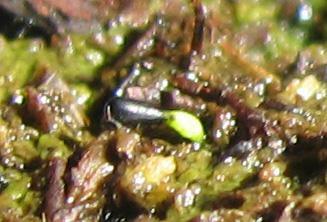 The first year of their lives, Venus Fly Traps will be very tiny. It is possible to speed up their growing process by skipping dormancy the first year, but they will definitely need a dormancy period at then end of their second year. A way to get mature plants faster and an alternative to sexual propagation of Venus Fly Traps is Vegetative Propagation. Vegetative propagation of Venus Fly Traps is the preferred method of reproducing them if you want to preserve the characteristics of a particular plant, say a cultivar or other unique specimen, because any plants born out of vegetative propagation will be genetically identical to the parent plant. Also, the amount of time to get a plant to adulthood is usually one to two years, compared to the three to five years required to raise a plant from seed to adulthood. The two simplest ways to vegetatively propagate your venus fly trap are actually quite easy. To take leaf pullings from your plant you have to uproot the plant and expose the rhizome. Then you should look for a leaf that is on the outside of the rhizome that is very healthy. Firmly grasp the leaf and give it a gentle jerk downward. The goal here is to try to get as much of the white part of the rhizome as possible where the leaf is attached to the main plant. Trim the trap off the leaf and place it in the soil that you typically use for Venus Fly Traps. Keep it very moist and give it plenty of light, at least a 13 hour photoperiod. Be patient. It takes a long time, up to 2 months, to see any growth. The first growth will look like little nubs and then it will turn into little leafs. See the images below. It is important to note that leaf pullings should only be done with healthy plants and not with any plant that is flowering. It is possible to do leaf pullings with a sickly plant, but the success rate will be lower than with a healthy plant. If you take good pullings from a healthy plant, your success rate should be 75% or greater. 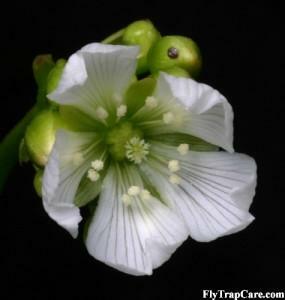 If you choose to not allow your Venus Fly Trap to flower and cut off the flower stalk, be sure not to waste it! It is possible to use the flower stalks like you would leaf pullings. 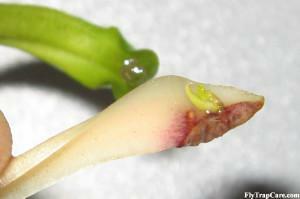 Once you snip off the flower stalk as close as you can to the base where it is growing out of the center of the plant, if you stick the base of the flower stalk in the ground, it will likely start growing plantlets where it is in contact with the soil. Plantlets on a Flower Stalk. Seedlings in the foreground. I have had great success just sticking the flower stalk into peat moss in an upright position, just like it was growing out of the plant. I have only had moderate success when laying the flower stalk on its side. I also attempted to cut a longer stalk (3 or 4 inches) into 1 inch pieces and stick each of those into the ground. The best success I’ve had is by simply cutting the stalk when it is between 1 inch and 3 inches high and sticking it straight into the ground. 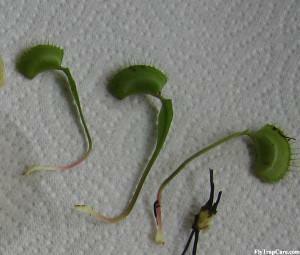 The simplest way to propagate Venus Fly Traps is to just let them grow! Venus Fly Traps naturally propagate by forming a second growth point in their rosette. You can tell when this has happened because the leafs become crowded and they seem to be growing out of two or more center locations. Once you see that your plant has formed a second rosette, leave it alone until the following spring when it is time to repot. In the spring, when you go to repot your Venus Fly Trap, you can separate the two rosettes. If the new rosette hasn’t had a chance to form its own root system, it’s best to leave the two plants together another year until the new plant has a chance to take root. Separating the two plants too soon can result in the death of the new plant. 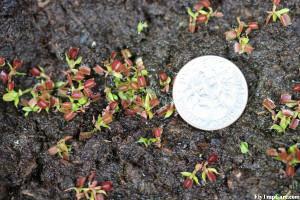 Another way to propagate Venus Fly Traps is through tissue culture, or in vitro propagation. This method is for the advanced cultivator who has access to a laboratory or wants to try challenging work at home. The plants don’t grow in any kind of soil, but rather in petri dishes. Venus Fly Traps can be propagated through tissue culture by using seeds, leafs or flower stalks. Tissue culture is the fastest way to produce a lot of plants and is the preferred method of rapidly propagating genetically identical plants, such as Dionaea muscipula cultivars. The basic idea for plant tissue culture is to sterilize the tissue and container first in a solution that usually contains alcohol, peroxide and bleach. Then the tissue is placed in a growing medium that is basically a hormone shake. It contains lots of vitamins and other goodies that the Venus Fly Trap needs. The tissue is left in this medium until good leaf formation has occurred (somewhere between eight and 16 weeks), then it is moved to its standard media. For more information about tissue culture, be sure to see the article on Plant micropropagation.